In the UK funerals could rarely be considered a social event and normally, unless the media are involved, numbers attending are not usually high. So I would only consider going to a funeral if it was someone directly connected to me. In practice work commitments often makes this not practical and I have attended very few funerals. Given this you can guess my initial reaction when my guide in Ghana suggested we went some way to find a funeral of someone neither of us knew that we could attend. 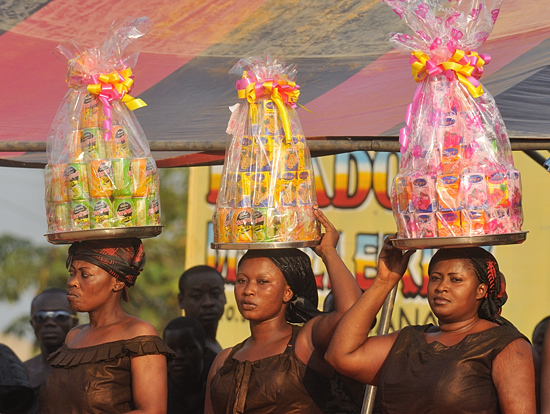 However I quickly learnt that funerals in Ghana are very much a social event and attended by large numbers of people. It was also an obligation to attend. 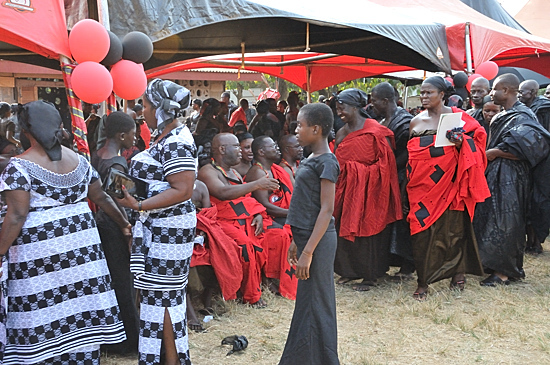 Earlier in the week, I had people pointed out to me who were going to a funeral they wore traditional clothes either in black or black and red. 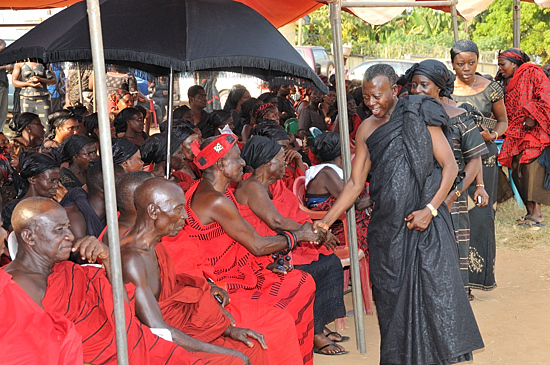 My guide in several pieces, while we were involved in long drives, told me about the types or style of traditional costumes and what each meant, that supporters wore black, while the direct family also had some red. That if you could not go you could send a proxy, that there were funeral organisers, professional mourners, and a procedure from start to finish. I found out that it's exceptional for a person to be buried in a week, normally its more like 3 weeks, but a delay of up to several years can occur to allow for relatives distributed around the world to all get back together at the same time. He told me far more, and I made detailed notes, far more than I can include here. We also discussed beliefs and other cultural and family traditions and things that happen within the country. On arrival at a funeral there are a number of practices to observe, including going to the head relative and shaking their hand, followed by a pattern of lines of people that you need to go along and greet and shake the hand of each. This is not difficult as you can follow others. Then its time to join the queue to make a donation towards the funeral expenses, my guide did this for me, allowing me to start taking photos. On making the donation you get a receipt, and you take this to the announcer who reads out all the donations made. By making a donation we were accepted as a part of the process, given chairs in the front, and any time anyone asked me about paying to take their photo I just showed them my receipt, and all except the drum groups were then happy. The place was arranged like a large central area about the size of a football pitch and tented shade on 4 sides. One of these was smaller and was occupied by a band and announcer. In action there were two other drum groups there all the time and a third visited for a period. This was the combined funeral of 3 people, and photos of these were on tables, at points around the edge. Under the shade was a large number of chairs and behind this some chairs and groups of others. On top of this there were people coming into and leaving the site on a continual basis. It was therefore not possible to estimate the total number of people who visited, but by counting a group and multiplying this up, I estimated there to be around 4,000 people on the site at any one time. Most seated in the shade and some of the groups around the periphery stayed all the time. Mine was the only white face present. Some of the people in the front were village chiefs shown by a cloth band around their heads, and some were shaded by umbrellas, although they were already under the tenting shade, so I presume this was protocol. A small number also had people fanning them. Besides the handshaking, there was a boy dancer who danced for each person arriving and often given small amounts of money, that was shared with the drum group he was with, some others joined in these dances. A singer and several other dancers were present at times and every now and then a line of girls would come in balancing gifts on their heads, and sometimes also bringing a goat. Another Muslim group in different costume arrived with their own drum group and colourful costumes, and stayed a while taking it in turns to dance with the drums. The band, announcers and singers and some others were amplified and blasted out of powerful speakers. Around the outside areas some young people collected, teenage girls in one group and a group of boys nearby. In another area small children played a game using bottle tops and in a few places behind there were people dancing along to the music. We had to leave when it was getting dark, but it was going to continue for some time, with quite a lot more to play out. With many funerals I understand that drinks, some alcoholic, would be handout out, and a party develops, and its as a part of this that a lot of dating occurs. 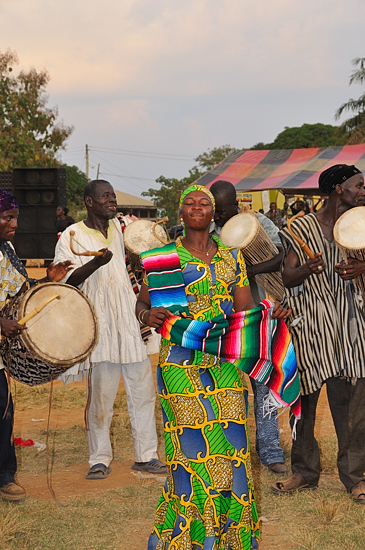 Ghana is largely a Christian country with a variety of church types, but many have underlying beliefs that come from before the introduction of Christianity. They believe that a person after death goes to the land of the dead, this is in effect another plane or dimension, not the equivalent to heaven or other groups definitions. Although a lot appears to be based on tradition, costumes, what happens, and underlying beliefs, some parts are updating so its a live belief system. The people of Ghana are very friendly and by the time I visited the funeral I had become used to how happy most are and how well you can get on with them, although many you can't understand, even when they are speaking English. I was surprised at how much freedom I had to take photographs and how I could go anywhere, even amongst the people in the central area while things were going on, and that there were no objections to me photographing anyone, young or old, and that some even called out for me to come and photograph them. Being able to show them the photos on the back of the Nikon D300, probably caused a greeter interest in being included. On a future visit I would like to photograph another funeral, perhaps a smaller one and to allow sufficient time to follow the whole event to its conclusion. I would like also to follow up on other belief systems further, and another suggestion my guide had was to get a village witchdoctor he knew to do a long detailed dance for me in full traditional costume and photograph this. There are so many opportunities here its difficult to know what to include, some maybe we should cover sooner rather than later as their practices may not survive into the future. See Also: Our Funeral Photo Gallery where you will find a large selection of images showing different activities and groups of people who attended.